The Salvaged Icepick distinguished itself from the pick line due to its superior gather speed at the cost of valuable components. Not the best sound to harvest a corpse, but it is appealing to hit some dead eyes with it. It is decent to pickaxe softside walls with it, not recomending to build one, but using one you find is better then the regular pickaxe. This is not worth researching due to the big amount needed to research and a big amount to make it. Having it isn't even that at good as it seems... 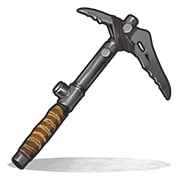 It just mines quicker than the Pickaxe and you receive the same amount as the pickaxe.